Hi there! Happy Monday! 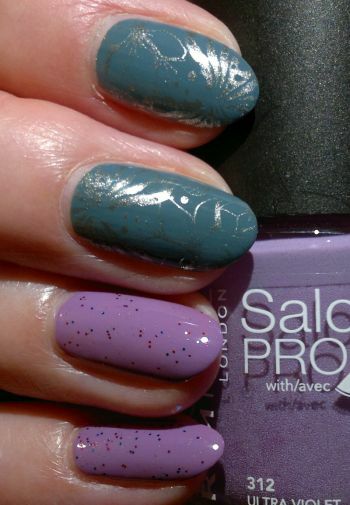 This week’s going to be NAIL WEEK, so I’ll be posting about manis only. I’ve also decided to redo the 31 Day Nail Art Challenge. I’ve done it before (I’ve completed it in summer 2017), and I want to do it again – but on my own terms. I won’t be doing 31 manis in 31 Days, but over the next couple of months. Alright! 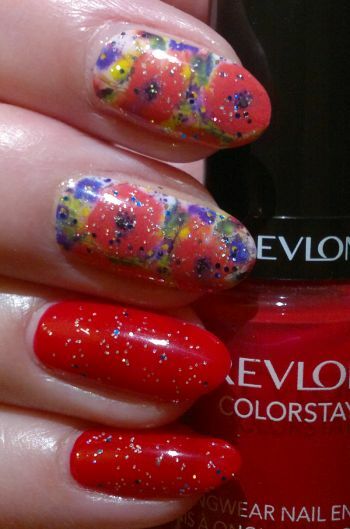 For this mani, which is challenge #1 RED NAILS, I painted my nails (pinkies, ring fingers) with Revlon Colorstay 120 Red Carpet (2 coats). I used water decals on my thumbs, index and middle fingers. I tore one of the decals, and another one ended up looking very wrinkly. So I decided to cover up the mistakes with glitter. I chose Rimmel 60 Seconds 831 Magic Stardust. 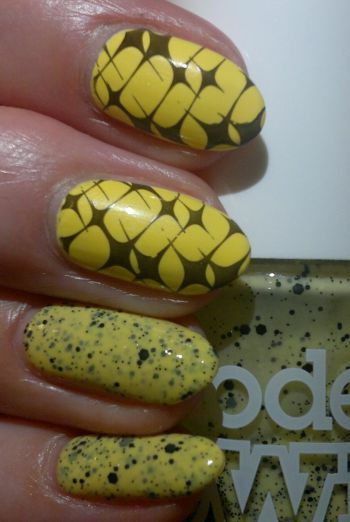 I have a Nail Of The Day post for you today. 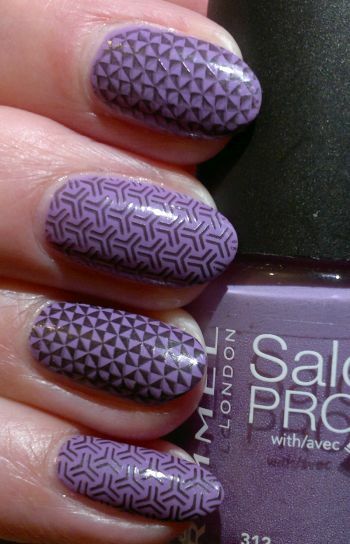 For this mani I painted my nails with Rimmel Salon Pro 312 Ultra Violet (2 coats). This kind of nail colour (which I like to call milky purple) is my favourite nail colour! The stamping plate I used it MoYou London‘s Suki 14 plate. 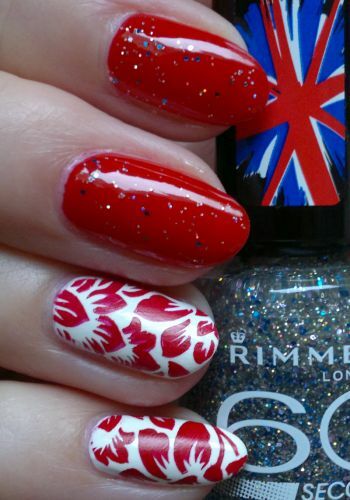 I really like the image that I stamped on the pinkies and middle fingers! 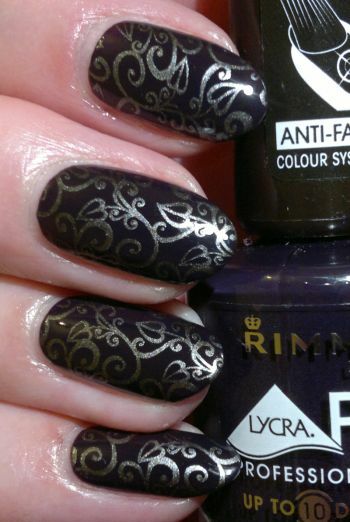 The black polish I stamped with is Rimmel 60 Seconds 820 Hot Black To Go. 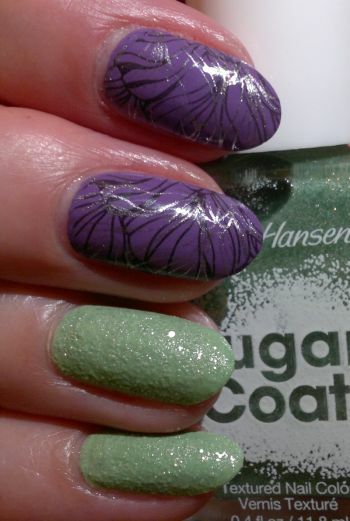 Whilst this wasn’t the most spectacular mani, I did like the look of it!